Epoxidized Soybean Oil Market size was over USD 300 million in 2017 and industry expects demand of above 350 kilo tons by 2024. Increasing demand for bio-based plasticizers owing to growing demand in processed food & beverage can coatings would escalate epoxidized soybean oil market size. Restrictions on phthalate plasticizers in food & beverage sector is likely to drive market growth. ESBO is cost effective and has high thermal flexibility & stability, thereby industry growth. Stringent government regulations on utilization of non-phthalate plasticizers would stimulate epoxidized soybean oil market demand in the estimated timeline. ESBO is an eco-friendly bio-plasticizer which complies with standards set by REACH, FDA, and EU which is likely to favour product demand. The product is utilized as co-plasticizer for PVC applications. It is also utilized as an acid scavenger for inks, pigment dispersion, and agricultural chemicals driving market growth. Global lubricants market size was USD 115 billion in 2016. ESBO based lubricants have high oxidative stability and low pour point. The product is utilized to decrease friction and wear of surfaces meeting different substrates in motion. It is extensively used in auxiliary equipment, air compressors, gas engines, heat transfer systems, natural gas compressors, and hydraulics, thus propelling product demand. Epoxidized soybean oil are of great value for stabilizing additives. The product is cost effective and enhances performance for heat & light stability. It has high detergent resistance, low volatility & viscosity and improves processing speed. Thus, positively supporting ESBO market growth. Government initiatives along with heavy capital investments in R&D for environmentally friendly product would fortify market growth. ESBO is formed by oxidation of soybean oil with hydrogen peroxide in the presence of formic or acetic acid. It is non-toxic, clear to yellow liquid, low cost and potent synergist to metal additive composites in vinyl systems which would favour epoxidized soybean oil product demand. ESBO is extensively utilized in metal cover gaskets of glass jars, which can cause health problems. Excessive usage of product in packaging of food & beverage that can cause severe health hazards which may hamper industry profitability and epoxidized soybean oil market price trends. EBSO industry size from soybean oil is predicted to exceed USD 530 million by 2024. Soybean oil is generally favoured amongst oleo oil manufacturer as compared to other bio-based products due to its wide availability and low cost which will drive product demand. Growing awareness regarding bio-based plasticizes in Brazil, China and India owing to strict government regulation with respect to protecting environment is likely to drive the market globally. Epoxidized soybean oil market size from formic acid may witness gains up to 5% by 2024. Formic acid has anti-microbial & coagulating property and absorbing capacity. It is soluble in water, alcohols, ether and acetone, thus propelling product demand. Epoxidized soybean oil market size from fuel additive application may register strong gains up to 6% by 2024 owing to increasing efficiency and performance of automotive. The product has high flash point, thermal stability, low volatility & toxicity, and is biodegradable & non-corrosive in nature. These fuel additives support in curtailing emissions and intensifying performance of vehicle, hence driving ESBO market growth. UV cure segment is may exceed USD 85 million up to 2024 owing to multiple usage in industrial coatings. The product provides flexibility and strength to certain fragile resin systems including urethane and polyester resins. Environmental concerns rising from disposal of conventional plastics and other polymers have intensified market for renewable plasticizers. These factors may cater towards stimulating ESBO market growth. Functional fluids segment may witness gains up to 5.5% by 2024. This oil is used in functional fluids to diminish abrasion and stress between surfaces, temperature stability, provide oxidation, and corrosion resistance which will drive ESBO market demand. 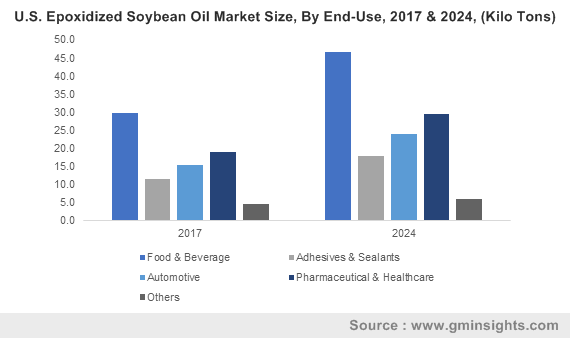 Epoxidized soybean oil market size from adhesives & sealants may observe strong gains up to 6% by 2024. Adhesives & sealants are adaptable products that have several applications in construction sector. The product offers benefits including easy bonding of joints without harming overall appearance of the product. It is utilized due to its capability to evade relative movement of substrates, corrosion resistance and to seal gaps, hence driving ESBO market growth. Pharmaceutical & healthcare segment would reach up to 90 kilo tons at the end of 2024. It is used as plasticizer in froth PVC utilized in cap linings, pharmaceutical gloves & films. These factors may contribute towards market growth. Asia Pacific led by Japan, India and China epoxidized soybean oil market is predicted to exceed USD 175 million up to 2024. The product has extensive applications as stabilizer in plasticizers owing to cost effectiveness. Easy sourcing of raw material and availability of cheap labour for EBSO production process may fuel regional market growth. Europe driven by France, UK and Germany epoxidized soybean oil market demand may witness significant gains up to 6.5% by 2024 owing to growing food & beverage industry. Stringent regulations pertaining to phthalate plasticizers by EU in packaging industry may stimulate product demand in the region. Brazil market may register strong gains in the estimated timeframe owing to growing awareness for bio-based plasticizers which are non-toxic and biodegradable. Escalating demand for non-phthalate composites in several end-use industries including coatings, construction and agriculture would reinforce ESBO regional industry growth. Global epoxidized soybean oil market share is competitive and fragmented with key manufacturers including Arkema SA, ADEKA, CHS Inc, Valtris, Makwell, Flowtech and Hallstar. 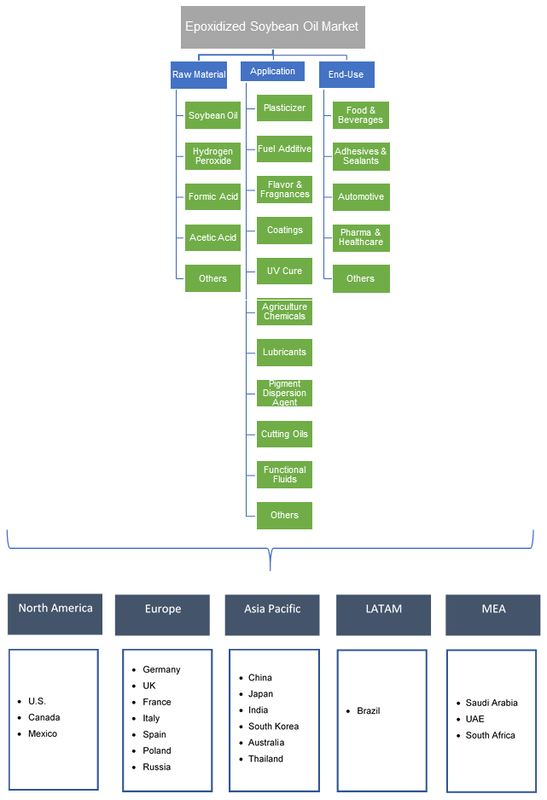 Companies are involved in joint ventures, strategic alliances, and partnership to implement pioneering technologies with enhancing in production capabilities to cater increasing ESBO demand. In October 2015, Hallstar acquired Fortinbras Commercial Industrial Ltd., manufacturer based in Brazil to expand its product portfolio and increase its market reach in Latin America, which may benefit ESBO market. Epoxidized soybean oil is a bio-based plasticizer with high oxirane efficiency and stabilization performance. It results from oxidation of soybean & unsaturated oils with hydrogen peroxide. It is non-toxic and yellowish viscous liquid that is utilized as a stabilizer in PVC plastics and copolymers.